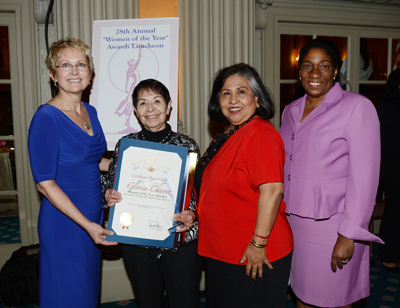 The long-time president of a local community organization was recognized Monday during the 28th Annual “Woman of the Year” Awards presented by The Los Angeles County Board of Supervisors and the Los Angeles County Commission for Women. Gloria Chavez is a resident of City Terrace, a hilly blue-collar neighborhood located in Unincorporated East Los Angeles near the junction of the San Bernardino 10 and 710 Freeways. 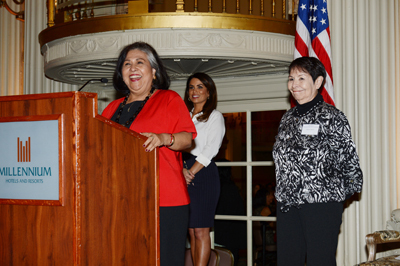 Supervisor Gloria Molina selected Chavez as her First District’s 2013 honoree; she was among nine honorees from across the county recognized for their hard work and dedication at a special award luncheon at the Biltmore Hotel in downtown Los Angeles. The awards are presented in March as part of the observance of Women’s History Month, a time to pay tribute to the impact women have had in both the pubic and private sectors. The County’s honorees were selected for their service to the community, and more specifically as volunteers working on behalf of women’s issues. Within their professions, they have advocated for women’s rights, and according to the event program, the honorees are exemplary role models to women and have worked to bring about social and economic change to further women’s equality. Chavez has served as the City Terrace Coordinating Council’s president for 26 years. Under her leadership, the Council has encouraged young women to go to college and to spend their summers working in the organization’s Creative Thinking Program where they not only help tutor school-aged children, but also serve as positive role models for the mostly low-income participants, especially the girls. The program also provides high school aged youth the opportunity to volunteer as peer tutors, according to the commission. Back in the 1970’s, Chavez was a homemaker and admits she didn’t know “the first thing about community organizing.” But seeing many problems she got involved with the United Neighborhood Organization (UNO) in East Los Angeles and became the group’s first president. She went on to establish the Coordinating Council in the mid-1980s, according to the commission. “As President of the City Terrace Coordinating Council, she demonstrated what women in leadership positions can accomplish for their communities She also demonstrated an ‘I can’ attitude. She encourages everyone to never fear unknown territories, such as community organizing,” according to the commission’s event program. The City Terrace Coordinating Council has taken on several issues including public safety and creating enrichment opportunities for young people in the community. Over the last 26 years, the council, lead by Chavez has brought new traffic lights and streetlights, paved roads and neighborhood sidewalks, and a reduction in graffiti. Violent crime is down in City Terrace. Also honored at the Los Angeles County Commission for Women’s 28th Annual “Women of the Year” Award Ceremony, are: Second District honoree Marsha Temple; Third District honoree Kim Lamorie; Fourth District honoree Sara Pol-Lim; Fifth District honorees Gloria Pollack, Karen Sutherland and Ingrid Chapman. Community-at-Large Honorees are Xiomara Flores-Holguin in the area of Health, Joyce Feucht-Haviar in the area of Education, Zna Portlock Houston, Esq. In the area of Law/Public Safety. LA County Commission for Women, commissioners are: Veda E. Ward, Ph. D., president; Becky A. Shevlin, Vice President; Charlotte Lesser, treasurer, Ruth V. Creary, Ph.D.; Reiko Duba; Norma L. Gallegos; Gerda Govine, Ed. D.; Alice S. Petrossian; Michelle Piñedo: and Olivia G. Rodriguez. March 14, 2013 Copyright © 2012 Eastern Group Publications, Inc.